Pantry Efficiency – How’s yours? Okay, before I even get started, I need to confess that I’m a bit of a food snob. I love food, I’m extremely brand loyal and its my #2 biggest expense in my budget (Daycare is #1). I am not the one to talk to if you want to know how to feed a family of 4 for $200 a month..or even $400 a month. I shop sales, I use coupons, but I still spend a small fortune. As much as I loved eating fresh peaches off my mom’s tree growing up, it was equally horrifying when she pulled out a 10 year old can of brown peaches from the basement and expected me to eat them. Being my mother’s daughter, I know I have some of these same tendencies. I didn’t want to throw away expired food, but I didn’t want to feed it to my family either. The compromise was to figure out how to use food before it expired. What a simple concept huh? Not really. Buying Stuff because it’s on sale, but not knowing how much of it you already have at home. Buying stuff because it’s cheap, but not having a specific purpose for it. Buying exotic things and not having a specific purpose for it. Buying crappy products in bulk and then not wanting to eat them when you realize they taste bad. I know myself and I know that in order to find a system that works, it can’t add more than an extra 5 minutes to my grocery routine, so here’s what I came up with. 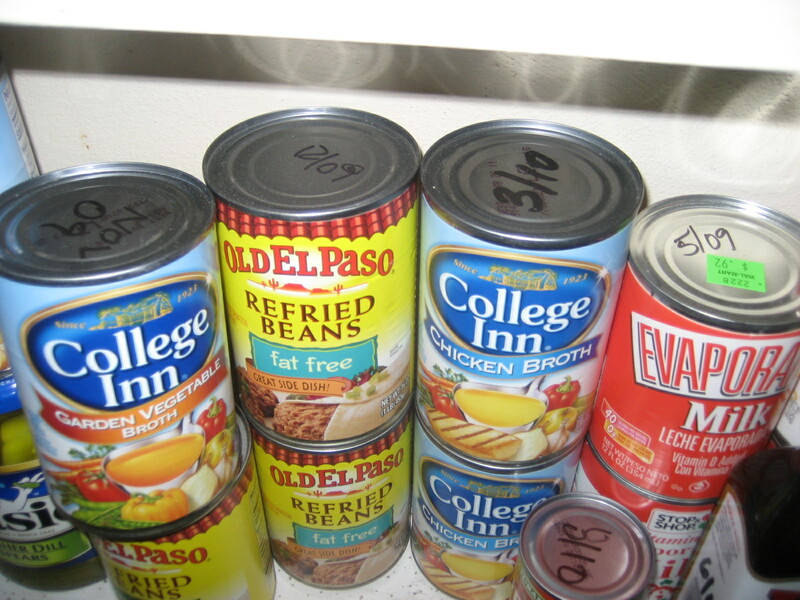 First, I labeled all my canned goods with O (short for old), so that I could start with a clean slate. The next step was to “group like things together.” How many people just shove things in the cupboard? I know I did. This helped prevent having 25 cans of beans around the house..all in different spots. All incoming canned goods are labeled with the month/year of purchase. Why not the expiration date you ask? Because it would take forever to read all the different dates. Plus, I wanted to get a sense of my turnover rate which is much easier to do when I know when I last purchased something. Try like heck to use up your old items. You’ll find that there are some things you thought were staples that you actually use very rarely. When you find one, eliminate it from your staple list and only buy it when you need it for a recipe. I know many people also periodically hold pantry purge months that also help. Before you leave for the grocery store, quickly scan your cupboard to see if anything needs replenishing. Avoid stocking up on plastic containerized items for too long. The plastic that is used in food packaging does not have the same kind of barrier properties as metal or glass packaging. That is why ketchup and peanut butter go on sale all the time. Try to avoid buying more than 6 months worth of those items. After about a year of this, you’ll have a better understanding of what your food turnover rate is and hopefully that box of corn bread mix is not taunting you every time you open the cupboard. 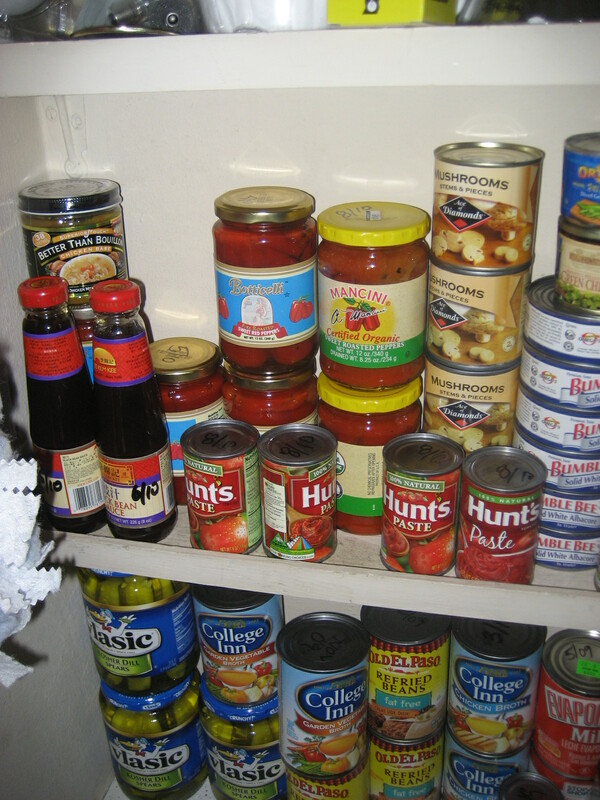 Coincidentally, Frugal Dad also posted an article today on pantry storage as an emergency preparedness tool. You should go check it out. My question to the readers. What pantry item heckles you every time you open the cupboard? Is it the instant potatoes that you thought you’d use because people say they’re so versatile? Is it the gross store brand tuna fish that you bought 10 cans of but discovered it was fishy mush water when you opened it? For me, it’s the 2 jars of lime pickle that I bought from the Indian grocer. Yesterday’s GRS inspired us to write meal system posts which are in our queue now. I make a list before shopping so I can take advantage of the sales, and combine some coupons. However, I do know some things still sit unused in my pantry. I think Au Gratin potatoes are my nemesis. I never seem to use them all up in time, so I refrain from buying as many if they are on super-sale. We recently moved and about a month before moving day we started the “Pantry Challenge”… determined to eat everything before buying any other dry or canned goods, so we’d have less to move. It felt great to downsize the pantry, have less to move and start fresh at the new place. I think I had moved some of the muffin mixes and soups to 2 or 3 different houses/apartments. Next post: Extreme Frugalism – How many have you tried?